Bordeaux, Galerie des Beaux-Arts, Marquet, May - September 1975, no. 60; this exhibition later travelled to Paris, Orangerie des Tuileries. Paris, Galerie de la Présidence, Albert Marquet, May - June 1985, no. 5. Marquet was born in 1875 in the great port city of Bordeaux. 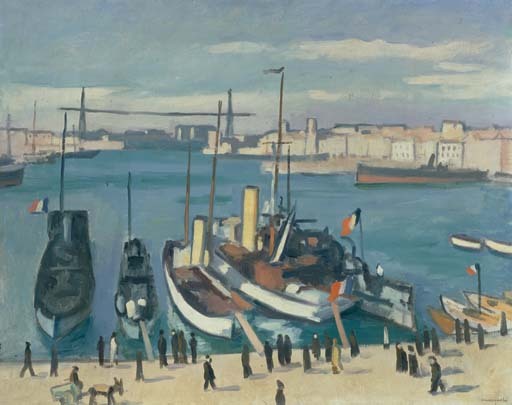 Although he left Bordeaux at fifteen in order to pursue his artistic career in Paris, the motif of the port, with its grand structures, play of light on water and bustling commerce, retained an enduring fascination for the artist. In the years around 1910, as Marquet was just beginning to win an audience for his art, when he was not scouring the quais of Paris for a subject for a painting, he was often travelling around the ports of Europe and North Africa - Hamburg, Naples, Rotterdam, Le Havre, Algiers, Tunis - in search of a motif. During the years of the First World War, Marquet's contract with his dealer Eugène Druet enabled him to move to the south of France, and the present work dates from one of the painting trips Marquet made to Marseilles at this time. Marquet's habit was to take a room in the Hotel Beauvau, from the windows of which one could get a broad view of the Vieux Port. The present work is replete with the busy human incident that Marquet often sought out in his port pictures. With its play of vertical and horizontal axes, it also offers up the careful geometry that informs much of Marquet's output. However, it is above all the glowing light that we encounter in the present work which reaches deepest into the essence of Marquet's art. Writing in 1913, Marcel Sembat, a member of the French parliament and early supporter of Picasso in his Cubist experiments, commented: 'No artist has the same relationship with light as Marquet. It is as if he owned it. He possesses the secret of a pure and intense light which fills all the sky with its uniform and colourless glow... Luminous as daylight itself and so transparent that a painting by Marquet gives the impression of a large window being opened onto the outside' (quoted in exh. cat., Marquet, New York, 1985, p. 6).